Peristaltic pump for sale is a kind rotor drive and squeeze hose, generate negative pressure, sucking slurries, and discharging through outlet under roller’ s push, finally forms pressure conveying of slurries. Peristaltic pump have some applications, such as: pumping foam concrete, slurry, slag, bentonite etc. Peristaltic pump can not only be used alone, but also with other machines or parts. 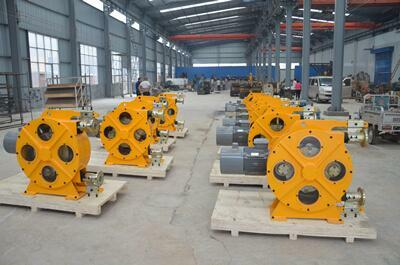 Like together with hopper, becoming peristaltic concrete pump. GCP20H-E and GDS1500 concrete pump is hose type structure concrete pump. Compared with ordinary concrete pump, hose type concrete pump can be used for pumping concrete and spraying concrete. When hose type concrete pump is used for spraying concrete, it need extra air compressor to provide need compressed air. Because of peristaltic pump simple structure, easy to operate and maintain etc feature, peristaltic pumps are widely used in construction, pharmacy, dry making, water treatment, papermaking, mining project.